Yesterday was my birthday (well, technically today because I'm writing this a day in advance haha)!!! Since turning 20, I've written about 5 things I've learned each year (check out 20, 21, and 22). All of the lessons hold true and my birthday is a great time to remind myself of my former words of wisdom. Fun fact about Alyssa: my birthday is also the only day of the year that I eat a Cinnabon. I LOVE Cinnabon. I follow them on social media, I've had Twitter conversations with their account, and I may or may not have had a Cinnabon as my phone background for a time. But it's not good for you, so I wait to have it once a year on my birthday. I am picky though, and will not accept a subpar Cinnabon. Joe and I went to two different Cinnabon stores on Saturday when we were celebrating my birthday and were unsuccessful. Wish us luck today (technically yesterday...but you know)! Anyway, back to the actual post. This year I am narrowing it down to 3 lessons, mostly because younger Alyssa has taken a lot of the really good ones and also because I like the sound of "3 in 23." Let's jump into the lessons! I wrote an in-depth post on vulnerability, so I won't rehash everything here. Suffice to say that being vulnerable in your relationships and ambition and with yourself is how you can find deeper meaning and connection. It's scary and it's not like you have to go sharing your soul with everyone that you meet, but I've found that over the past year I have benefited from acknowledging and leaning into what makes me vulnerable. We are really good at being our own worst critics. We know exactly what to say to ourselves to make the most negative impact and tear ourselves down. Then we try to "fix" ourselves and end up in a harmful cycle of never being good enough. Although it takes a while to completely modify our mindset, it is essential to have a positive soundtrack playing in our heads. I wrote a more detailed post this year about how to banish negative self talk. Since making these adjustments I appreciate myself more and am happier in my own mind. You'll face a myriad of challenges in your life; some that you seek out and others that are forced upon you by circumstance. Each time I've come to a point where seemingly everything is going wrong and I think "there's no way I can handle this," I do. And the next day comes and it's hard and tough, but I make it through the day and keep going. I've talked about the power of our minds many times (perspective, responding v. reacting) and the bottom line is that we are equipped to handle anything we face, even when it seems impossible. There you have it, 3 lessons that I lived through over the past year. Here's to 23 bringing even more lessons (hopefully at least 4, so I can do "4 in 24" next year)! 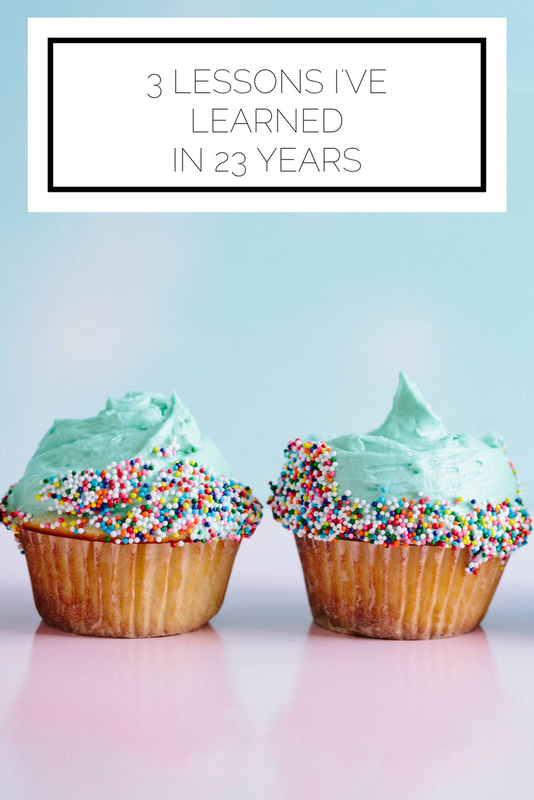 What were your biggest lessons when you turned 23? Any tips for this next year?